It’s October, let’s do this! 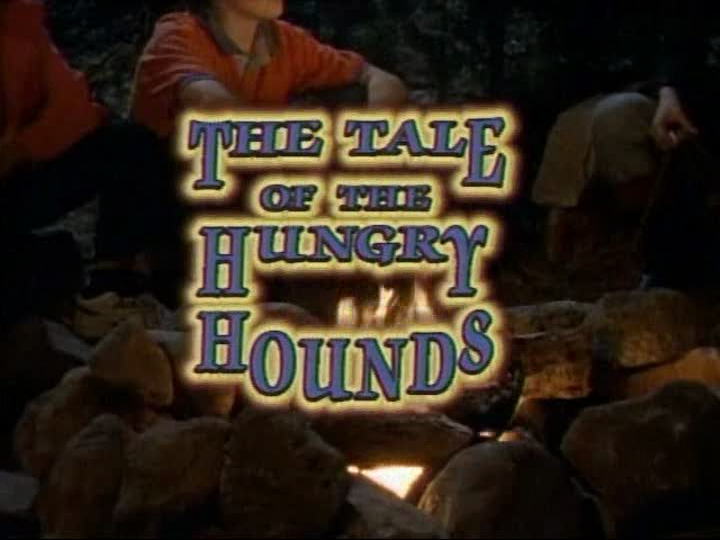 We’re going all the way back to Season One for this episode, which originally aired a ridiculous 22 years ago. Ohh, hounds. Sorry, moving on. We meet Pam, played by TV’s Mia Kirshner, who likes to rummage around her attic, and also enjoys subjecting her visiting cousin Amy to that terrible hobby. The two dig around until they stumble upon pictures of Pam’s late aunt Dora, who looks exactly like Pam. She was a talented equestrian, but Pam’s mother won’t let her follow in her footsteps, because parents are like, totally the worst. They dig around a bit more and find an old trunk that belonged to Dora, and I begin to wonder how dedicated Pam really was to her rummaging hobby, because that trunk is pretty hard to miss. Unfortunately for them, the trunk is locked, so that mystery is put away for another day. Later, Pam and Amy are out for a walk, discussing what there is to do for fun in Pam’s sad Podunk town. Pam’s answer? Look at a horse. Exhilarating. Pam climbs a fence to feed the horse a carrot, when suddenly her mom pulls up, frantically beeping her horn. This spooks the horse and knocks Pam off the fence and down to the ground, while her mother gets out screaming about how dangerous horses are. Her mom doesn’t want her around horses because Dora was killed while riding, though based on her reaction, you’d think Dora was eaten by horse. Clothes that are apparently on fire! It’s all of Aunt Dora’s old riding gear, which was never washed after the last time she wore it. This doesn’t dissuade Pam from putting on the jacket, and promptly getting possessed by Dora’s spirit. She them opens what appears to be a giant porthole in the side of their house, and steps outside. Amy meanwhile, is understandably confused, because it’s dark outside but it isn’t night, and because there are now steps going from the attic to the outside. So…what? They live in a trailer with an attic? Giles here is upset with Dora that she never got around to feeding the hounds, being that she was too busy gallivanting around, freeing foxes and dying. As a result, the hounds got hungry and angry and attacked poor Giles when he went to feed them. No, they didn’t maim and devour him, but they sure gave him a fright, which triggered the heart attack that killed him. He blames this all on Dora, and lunges at her accordingly. Possessed Pam and Amy run off to a nearby barn, where they’re locked inside. We get a cutback to the Midnight Society, presumably to get some exposition, but Kristen only tells us that Giles might have locked them in, or maybe it was another ghost in the graveyard. Cutaways do not work like that! 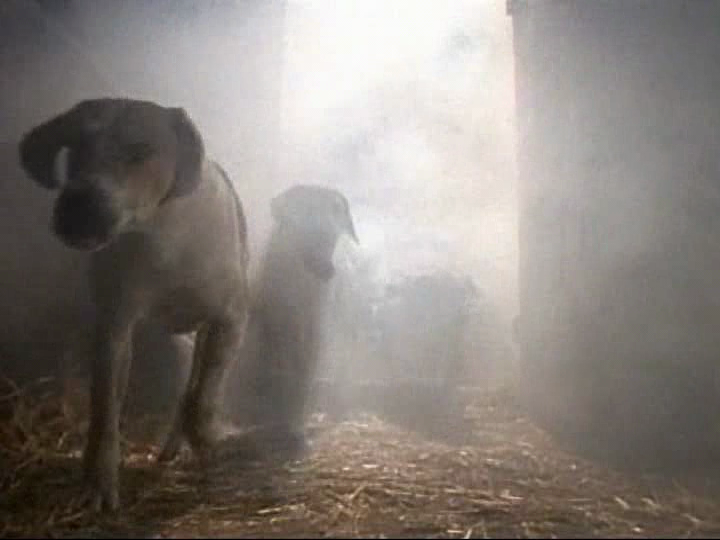 Back inside the barn, Possessed Pam is obsessed with feeding the hounds, much to Amy’s chagrin. Unable to convince her to stop, Amy instead locks her inside a cage. When Possessed Pam begs to be freed so she can feed the hounds, Amy questions what exactly she’ll be using as food. Of course it’s revealed Possessed Pam plans to feed Amy to the hounds, in a disturbing twist that no one saw com…oh, she’s going to feed them kibble, nevermind. As Amy sets off to find the kibble, Possessed Pam escapes her cage sets the hounds free. Well that certainly was…an episode. I guess the prospect of getting eaten by dogs is frightening, but that this episode offers. 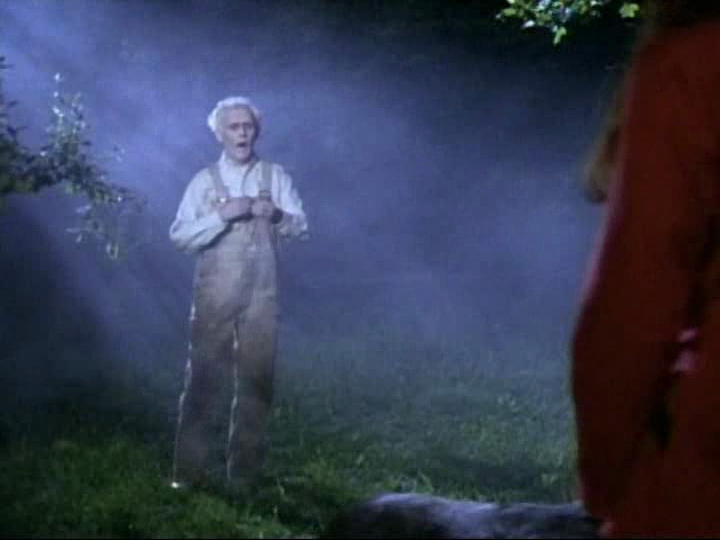 Ghostly Giles was alright, but he wasn’t in the episode nearly enough, and he definitely should have been mauled by the hounds. But it’s a kids program, so we got a heart attack instead. These can’t all be winners, so unfortunately Halloween Spectacular 2014 starts off with a bit of a whimper, but things can only get better from here, right? You know, assuming I actually write more. DUDE!! I am loving these AYAOTD reviews. They are killing me. You have got to do the “Tale of The Gruesome Gourmets” for one reason: Chuck. Words cannot describe this guy. seriously. Thanks! I’ve actually never seen that one, lets change that. Thanks to twitter, that review now has a stamp of approval from the actor who played Chuck. heck yeah! Did he confirm or deny Chris Farley as his acting choice? This was in the top 5 worst AYAOTD episodes imho. However, Mike!, I liked your wtf spin on it. Good job.